DIMETIX, represented in Australia by Birrer Industries , has released a new series of distance measuring sensors that can measure distances with millimetre precision, within a range of 0.05 to 500 metres. It is simple, flexible and measures without contact. Independent of the measuring distances, the device guarantees a measuring accuracy within 1.5mm deviation. The device can be configured for Stand-Alone-Operation. After switch-on it automatically proceeds with measurements. This allows for all kinds of applications without additional control units. All necessary configuration information is stored in the device. With an RS232 interface the measuring device can be connected to a PC. 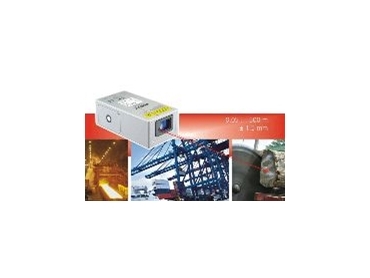 The RS422 interface is for industrial applications and allows cable lengths of up to 1000 metres. Up to 10 modules can be connected to a single RS422 line. An analogue output facilitates easy integration with the control system without implementation of any complicated interface protocols. The parameterisation of the analogue output can be stored in the device with a free-of-charge configuration program. All DLS-B devices have three digital outputs. Two outputs are programmable to switch on or switch off in case of a given distance. The third outlet activates a signal if an error occurred. The devices can be operated with a supply current of 9V dc up to 30V dc. The measuring device can be connected with a D-sub-connector. As an alternative, a direct connection into the device with a cable screw joint is available. Four light-emitting diodes (LEDs) display the status of the device. At a glance it can be determined if it is operating normally, or whether an error has occurred. A solid metal case makes industrial applications possible. The measuring device is protected against ingress of dust and water (IP65). Installation is simple. The free of charge software makes it possible to configure any DLS-A device and generate sample-commands. These samples can be used as templates for your own programs. The DLS-B is a laser sensor to measure distances. It is made for easy installation into industrial applications.